One Love Chicago is a two-hour yoga class consisting of 108 sun salutations that will be taught by 12 inspiring teachers from different studios throughout Chicago. Each teacher will lead the class through nine sun salutations. It is tradition in some yoga circles to participate in a 108 sun salutations practice at the change of seasons. In honor of the summer solstice, yogis from all over Chicago will participate in One Love Chicago. This event is appropriate for all levels. There is no pressure to complete the entire 108 sun salutations. You may give yourself permission to rest or to modify as your energy requires. 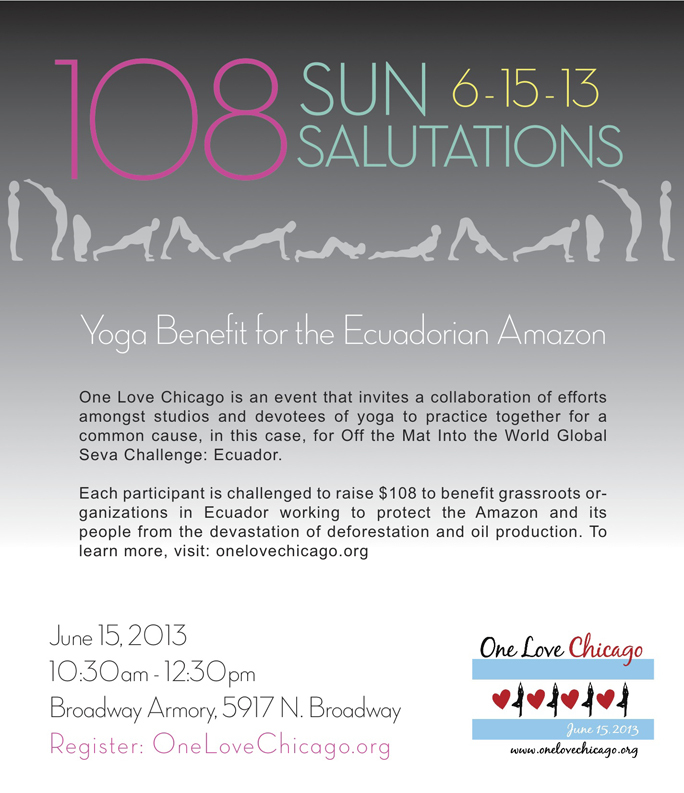 One Love Chicago is an event that invites a collaboration of efforts amongst studios and devotees of yoga to practice together for a common cause, in this case, for Off the Mat Into the World Global Seva Challenge: Ecuador. “One Love” is a movement to create conscious activism, made up of yoginis and yogis attempting to live our yoga, our understanding that we are one, off the mat and in every moment. One Love’s hope is to inspire asana practitioners to use the tools of yoga to open themselves up to Seva — sacred activism and conscious service. One Love, the movement, was born out of inspiration seeded by Off the Mat, Into the World and One Love Dallas. Each participant is challenged to raise $108 to benefit grassroots organizations in Ecuador working to protect the Amazon and its people from the devastation of deforestation and oil production.